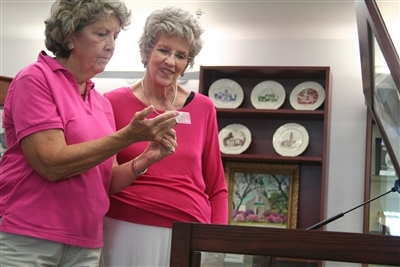 Anita Campbell, left, and Nell Thrift look at some tiny hymn books on display at the Florida United Methodist Heritage Center. Photos by Susan Green. A diary of circuit-riding preacher Isaac Boring dates to 1828. LAKELAND – Long before projection screens told worshipers what to sing and what to say, Methodists contemplated the word of God through hand-held Bibles and hymnals of all shapes and sizes. Collections of those and other relics of 19th and 20th century Methodism can be found at the Ruth K. and Charles T. Thrift Jr. Florida United Methodist Heritage Center at Florida Southern College. The artifacts include handwritten records and chronicles from Wesleyan followers’ first inroads into the Sunshine State, when preachers on horseback traveled lonely Indian trails through wilderness to meet with potential disciples at the homes and barns of believers. “Our most valuable possession is a diary of Isaac Boring,” said Nell Thrift, Florida Conference archivist who oversees the center. Boring was an early circuit rider in North Florida, where the seeds of the Florida Conference were sown. 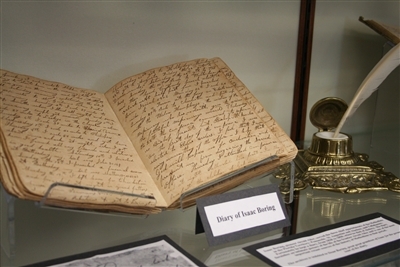 The archives center has handwritten journals for his service from 1828 to mid-1830. Also on display is a set of authentic leather saddlebags from the circuit-riding era. Beyond offering an intriguing glimpse into the past, the exhibits and many volumes of original records dating to the 1800s offer a treasure trove for historians, Thrift said. The oldest Florida Conference record at the center is an 1844 handwritten account of the Newnansville Circuit, an area now known as Alachua where the conference got its start. Visitors can trace the growth and changes of the Florida Conference through the exhibits, including a composite photo of clergy gathered in Ocala in 1893, and a 1919 Annual Conference group photo when the Florida church headquarters relocated to Lakeland. 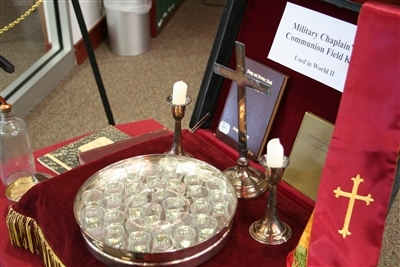 Florida Methodist Heritage Center exhibits include artwork of John Wesley, above, and a traveling communion set used by an Army chaplain in World War II, shown below. With its location at FSC, the archives center has provided research opportunities for a few college students already, and Thrift hopes the number of students taking advantage of the archives will increase. Since 2009, the Heritage Center has been housed in the Sarah D. and L. Kirk McKay Jr. Archives Center, next to FSC’s Roux Library. It is named for former FSC president Charles Thrift, an ordained elder, and his wife, both of whom championed education and Methodist causes. Charles Thrift, a historian and author, authorized storage for conference records at the college library before the current center was built. Nell Thrift said the Heritage Center offers better display opportunities and more room to work for volunteers and researchers than the previous space. “I think it [relics and records] give us a sense of the past, and learning about the past helps us understand the present and the future,” she said. Earlier this year, the Heritage Center became home to two John Wesley prints that had been on display at the Methodism founder’s home in Epworth, England. One, a reproduction of a painting called “Preaching from the steps of a Market Cross” by William Hatherell, is on display in the center’s exhibit room. The other was not in good condition and is being kept in storage until it can receive attention, Thrift said. 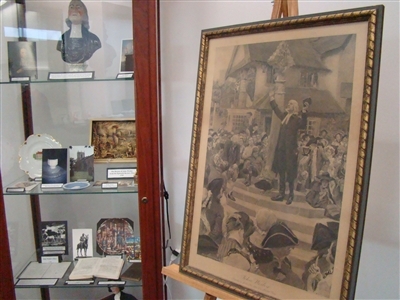 John Wesley artwork, including a bust of the famed preacher modeled after one created in 1781, is featured prominently in the center. Among the more whimsical artifacts at the Florida Methodist Heritage Center are a mouse ears hat from the late Bishop Earl Hunt, above, and a Coke bottle commemorating the Methodist bicentennial in 1984, shown below. Among other interesting exhibits is a World War II Army chaplain’s communion set that folds into a case for travel. Some artifacts are whimsical. 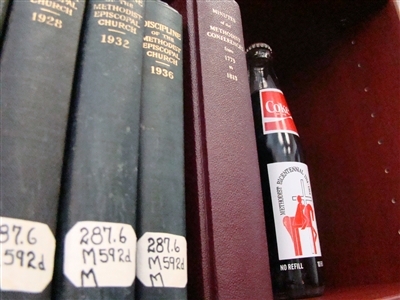 Nestled next to a volume of minutes from Methodist conferences dating to 1773 is a bicentennial bottle of Coca-Cola, with a cross and circuit rider image emblazoned in the popular soft drink’s colors of red and white. 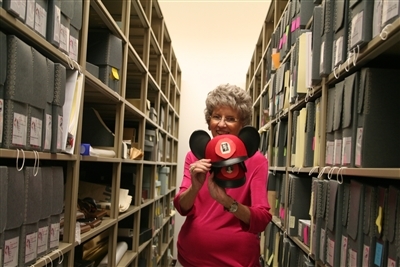 Thrift said she chuckled when she opened a box of memorabilia from the late Bishop Earl Hunt Jr., who presided over the Florida Conference from 1980 to 1988, and found a set of Mickey Mouse ears he once wore. The center also stores many local church records. Anita Campbell, who serves on the Florida Conference Commission on Archives and History, stopped in recently to do some research on Palma Ceia UMC. With her was her husband, John, a retired pastor from the West Virginia Conference who collects old hymnals and has an interest in church history. “It’s important to preserve the past so those who come after you have some idea where you’ve come from,” he said. The archives has annual journals as far back at the 1870s. If people have Florida Conference records or Methodist-related items they would like to donate, they can call the center at (863) 680-4992. The Heritage Center is located in the McKay Archives Center at Johnson and McDonald avenues, Lakeland. Generally, it is open from 9 a.m. to 1 p.m. weekdays. Call (863) 680-4992 for information.